If you have little ones, you have likely come in contact with hand-foot-and-mouth disease. My son’s first experience with the disease when he was a little over one year old, but before that I hadn’t even heard of it. Now it seems I hear about hand-foot-and-mouth disease all of the time. After our experience with the disease, I did research and learned so much about it that I wish I would have known before my son got it. I had heard others talk about it, but never really knew what it was. Hand-foot-and-mouth disease is a viral illness that most commonly affects children and infants 5 years of age or younger. Akron Children’s Hospital shares that kids ages 1 to 4 are most at risk for the disease, as infections are common in childcare centers, preschools, and other places with close quarters. The disease is most commonly caused by a virus called coxsackievirus A16. Outbreaks are most common during the warm summer and early fall months, but can happen year-round in tropical parts of the world. 2. How long does it take for symptoms to show? From the time the child is exposed to the disease, it takes 3-6 days for the initial symptoms to show up. This is called the incubation period. 3. The LAST symptom is the rash — and it’s not just on the hands, feet and mouth. Even though the disease is most clearly identifiable by the rash and blisters, those are usually the last symptoms to show. The initial symptoms include fever, lack of appetite, sore throat and runny nose, according to the Cleveland Clinic. My son was exposed to the virus on a Friday, and on Monday morning he woke up with a fever. He was lethargic and had a poor appetite, which also are initial symptoms. He wasn’t drinking much, which I later learned was because his throat hurt. At the time, we thought it was teething. Akron Children’s Hospital advises that since very young kids might not be able to communicate that they have a sore throat, if a child stops eating or drinking, or does less often, it’s a sign that something is wrong. On Tuesday, my son had no fever, so we sent him back to daycare. Wednesday afternoon, daycare called when they noticed the rashes and blisters. A trip to the doctor confirmed it. It is spread through any fluid coming out of your child: saliva, feces, coughing, sneezing, fluid from open blisters, etc. The best means of avoiding infection is constant hand washing and disinfecting. 5. There isn’t really a treatment. Children who are having trouble swallowing may be able to be prescribed “magic mouthwash,” a mixture made by a pharmacist that can be applied to sores to ease the pain. Cold foods, such as ice cream or popsicles, can be helpful, as well. Children with blisters on their hands or feet should do their best to keep the areas clean and uncovered. To prevent infection, antibiotic ointment can be applied to blisters that pop before they are covered. Call your doctor if your child remains very irritable, can’t be comforted, is sluggish, or seems to be getting worse. 6. You and your kid will be quarantined for days. Unfortunately, this is not an illness from which your child will recover overnight. 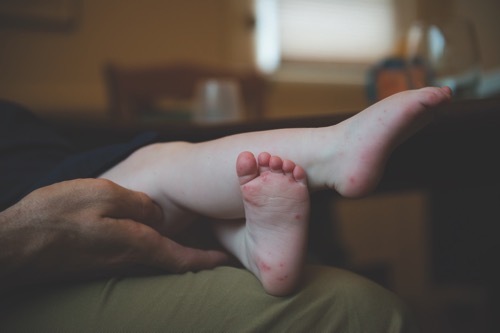 According to the Cleveland Clinic, although your child may be most contagious during the first week, he or she may remain contagious until the blister-like rash has disappeared, which will take several days. If your child is in daycare or school, you are going to have to keep him home for several days until it has cleared up. This is a challenge if you are a working parent, and even more so if you have multiple children. 7. Hand washing will be your new hobby. Constant hand washing and sanitizing, especially after diaper changes, becomes even more important. University Hospitals Rainbow Babies & Children’s Hospital recommends to always wash your hands before and after caring for your child. Use soap and warm water and scrub for at least 20 seconds. Rinse well and air dry or use a clean towel. It helps keep the virus from spreading around the house even more, and you from contracting it yourself. 8. Keep an eye out for dehydration. One of the more important things to watch for when your child has hand-foot-and-mouth disease is signs of dehydration. Because of the sore throat, many children do not take in enough fluids. Signs of dehydration are dry tongue, sunken eyes, or decreased urine output, according to Akron Children’s Hospital. We were lucky that after Monday, our son began eating and drinking normally. 9. Adults CAN catch it. Hand-foot-and-mouth disease is very common and usually affects infants and children under the age of 10, according to the Cleveland Clinic. However, the hospital also notes that since the disease is infectious, it can sometimes make adolescents and adults sick, too — Just ask my husband. The symptoms can be similar; my husband had the fever, decreased appetite, and sore throat. He thought he was getting strep until he noticed the blisters in his mouth. Our pediatrician, Dr. Joseph Borus at Green Road Pediatrics, said that in adults it most often looks like cold sores instead of the rash and blisters all over, which was what happened in my husband’s case. 10. This is one time it is OK not to share. When your child has the virus, it is totally OK for them not to share. In fact, it is encouraged. They shouldn’t share toys or, unfortunately, kisses. Be prepared to disinfect and sterilize EVERYTHING once those blisters have scabbed over and healed. Kristen Kelly originally wrote about this information in a blog entry about her family’s experience.